5 litres of this Vitakraft Magic Clean Silica Cat Litter are as absorbent and effective as approximately 20 litres of a standard clumping cat litter! It is extremely absorbent and economical to use. In terms of time, this means that Vitakraft Magic Clean Silica Cat Litter could last for up to 4 weeks. If you have a multicat household, naturally you will need to replace the litter more frequently. A particularly pleasant feature of Vitakraft Magic Clean Silica Cat Litter is that it absorbs odours in just seconds. This helps to prevent the unpleasant smells leaking out into the room or the rest of your home. 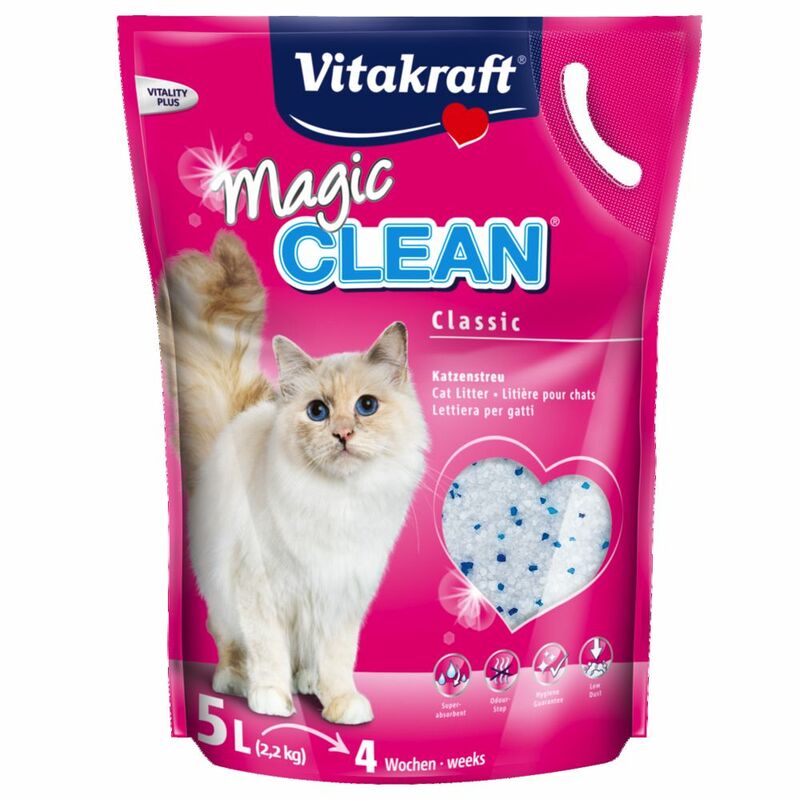 Vitakraft Magic Clean Silica Cat Litter also has antibacterial effects and provides hygienic absorption. Vitakraft Magic Clean Silica Cat Litter is particularly low in dust, making it perfect for allergy-sufferers. A real highlight is that it is made of pure minerals and does not need to be thrown into the rubbish – it can be decomposed. This ensures that no harmful waste is left from Vitakraft Magic Clean Silica Cat Litter, making it a real benefit for nature! Vitakraft Magic Clean Silica Cat Litter at a glance: Lasts up to 4 weeks: the silica litter only needs to be changed once every 4 weeks in a single-cat household Very effective: 5l of Magic Clean are equal to 20l of standard clumping litter Low odour: odours are absorbed in just seconds Hygienic: Magic Clean has antibacterial effects that ensure hygienic absorption Low-dust: low dust properties make this litter particularly suitable for allergy-sufferers Compostable: as the litter is made from pure minerals, it can be easily decomposed rather than needing to be thrown in the rubbish.